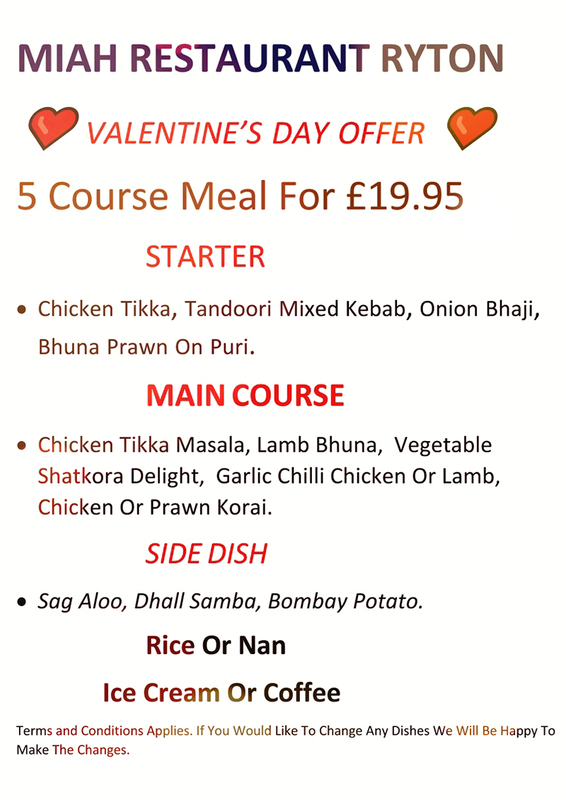 " You can bring your own alcohol from 15th of January 2019 "
Local Indian Restaurant & Takeaway near you in Ryton, Newcastle upon Tyne NE40 serving Ryton, crawcrook, Greenside. Wylam NE41, Prudhoe & Ovingham NE42, NE15 Throckley, Newburn, Lemington, NE21 Blaydon, Stella, Winlaton, NE39 High Spen, High Field, Rowlands Gill. Miah Restaurant & Takeaway is a fully licensed Indian Restaurant & Takeaway serving traditional Indian & Bengali dishes. (Britain's Most Favourite Dish)Cooked with mixed nut powder, Miah special sauce, decorated with cream and a slice of cashew nut. This is a slightly spicy dish as it is cooked with fresh chopped chillies, onions and fresh coriander. This is our most popular dish made form Miah special spice and mixed nut powder. Slightly hot to create a sweet and sour taste. Chicken, lamb, jambo king prawns. Cooked to our chefs own exclusive recipe. Tandoori chicken and minced lamb, cooked in a spicy tandoori bhuna sauce with a touch of coriander and boiled egg.